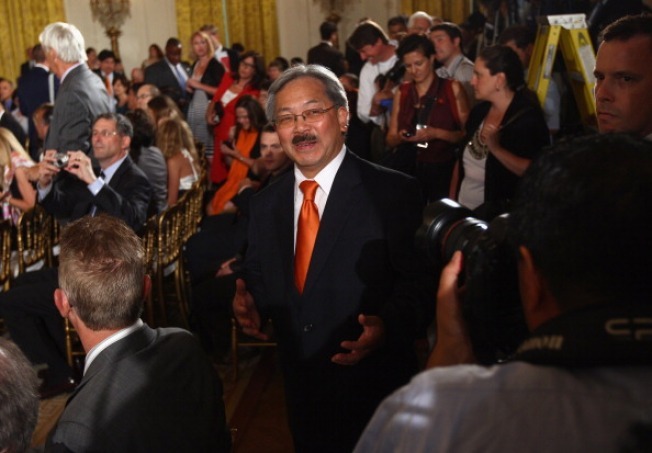 Mayor Ed Lee is being encouraged to shed the 'interim' in his title and run for the real deal. San Francisco Mayor Ed Lee is getting new pressure to run for a full-term, this time from a former mayor of SF. Senator Dianne Feinstein told the Chronicle Tuesday night, "...[Lee's] responsibility is to the people of San Francisco, and the voters alone should determine whether this talented public servant should continue on the job." Feinstein issued the statement after having a talk with Lee on Monday. The two were at the White House when the San Francisco Giants met with President Obama. Other groups have been pressuring Lee to run for office. The most vocal of them The Draft Ed Lee Campaign. Lee has been more receptive to running in the past month, recently saying he is in discussions to enter the race and wants to see where it goes. That's a switch from earlier this year when Lee was adamant he wanted to return to his job as City Administrator when his term was up. Lee was appointed by the Board of Supervisors in January to complete the remainder of now Lt. Governor Gavin Newsom's term.